Tonight is a special post as I am so excited to unveil my e-store’s new look, selling designer clothes online. I have been working hard with my sister for the last few months to make it happen. We officially launched The Con-nection around this time last year but it has been a patchy start as we were never granted access to the backend of our own website. This is because our website coder kept promising us he would finish the site but he never did. He built it on his own platform, which meant we couldn’t take it to anyone else so we had to start again from scratch. As you can imagine, it has been very difficult (and we shed just few tears and dollars) but it has taught us so much and to always trust our instincts. That’s all in the past as now it’s time to celebrate with a killer shoot featuring my gorgeous (and super talented) friend Elyse Knowles and what we have available for designer clothes online. Are you digging our new vibe? Don’t worry, everything you loved about us will remain the same, but now we are bigger and better with under 4-hour delivery (Melbourne Metro area) because sometimes you need that outfit ASAP and we totally get that. We have also introduced refunds- previously we only offered exchanges and credit notes as we were finding our way, but we want to make sure you are 100% happy with your purchase- and if you aren’t you should be entitled to receive your money back. You will also find more of a curated edit. That means you will find a smaller selection of pieces, these are pieces that we have spent hours to sort through and hand pick the absolute best of the best, because we know that you don’t have the time, and there is nothing worse than having a bunch of pieces in your wardrobe that don’t work together. You won’t find double ups on The Con-nection, we have worked hard to find that best black jumpsuit that sculpts your bod oh so well, a little lace piece that elevates any outfit and the best designer clothes online. We have also introduced new jewellery label, Linden Cook- we love that she is Melbourne based and her pieces are so gorgeous and edgy. The black choker that we shot in was one of my favourite pieces from the day. 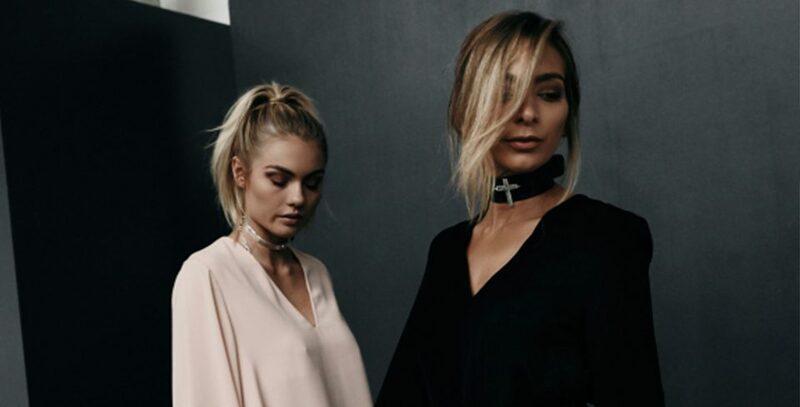 We are so introducing Melbourne label Thurley and international brand Mara & Mine. You guys!!! this is on a whole nother level!!! Congrats! So exciting for you both 🙂 Couldn’t be happier for you !! !